October is Breast Cancer Awareness Month and the motto is, Think Pink! There is no shortage of companies offering pink-related products in support of charitable organizations and breast cancer awareness. New to the movement is the Swarovski Crystal Group. They have designed a pink ribbon pin (retails for $55), a pink ribbon charm (retails for $55), a pink ribbon heart pendant (retails for $80) and a pink crystalline pen (retails for $24). 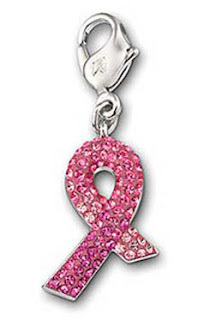 During this month 10% of the proceeds from the sale of Swarovski's breast cancer awareness collection will be donated to The Libby Ross Foundation. All of the products will be available at Swarovski's 230 boutiques nationwide and through authorized Swarovski retailers in the USA. Jewelry Artisans Beware: Success is Self-Made! Today I came across an online company that offers (of course, for a fee...which is not small by any means) to connect handmade artisans with retailers looking for wholesale accounts. Intriqued, I read more on their site. 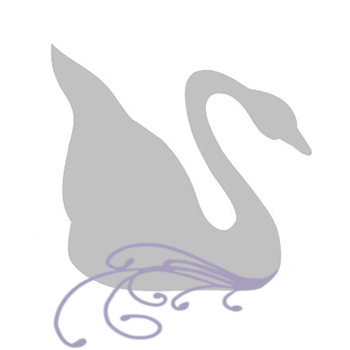 What I found was a clearly presented (well, marketed) site, providing all the information one would need to evaluate if they wanted to join or not and lots of artisan testimonials. What I didn't find -testimonials from the retailers. I found that odd since, well, as a potential "customer" of this site, not only am I interested in what other artists' experiences have been, but also what experiences/successes retailers have had in finding the right products for their stores/boutiques. Additionally, for jewelry artists to "qualify" to join, they must already have 5 wholesale accounts that they could provide references for when they apply. So, I ask this. If, I, (the artisan) already have 5 wholesale accounts (clearly showing that I've been successful with wholesaling my products to the right retailers) -why do I need XYZ wholesale company???? And to pay them $395.00 a year?? Most functions are working. Still a few to fix/correct but if you should run into any problems (commenting, recommending, etc) please, please feel free to contact me. By switching around the formatting, I was able to add a few new features, two of which are the "tweet" and "recommend" buttons at the top of every post. There are still two functions that don't seem to be showing but I'm actively working on it. I know I probably sound like a broken record but there are some fall designs coming soon -really! I promise! Since the beginning of fall I've been in a seasonal decorating kinda mood and of course, baking! Plus, for whatever crazy reason, I decided to repaint many rooms in the house (really, what was I thinking?!). How's your autumn been so far? Have you gone leaf peeping? 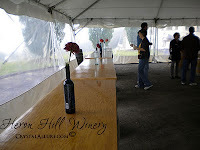 A few weeks ago, my husband and I took a break from daily life with a few friends and went on a Sunday wine tour. 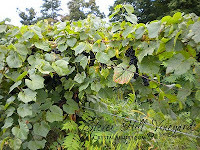 We purchased some tickets for the Keuka Lake Wine Trail that included eight wineries, but, we only got to five of them. 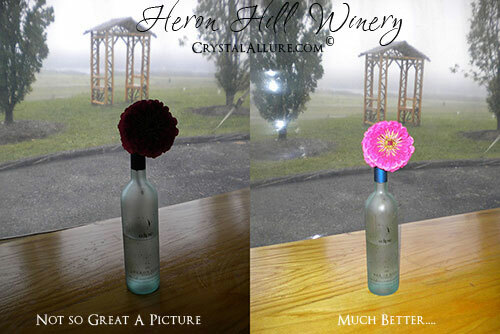 We started out at Heron Hill Winery and not only tasted some good wines but some good food too. Pictured to the right is a view from the pathway leading up into the winery. And if you like pumpkin, their Maple Pumpkin Cheesecake is to die for! They had a beautiful garden of which they clipped some flowers for the tables. We loved this pink flower but cannot figure out what it is. Do you know what this flower is? Please leave a comment -I'd love to plant it in my garden! Personally, I'm a white wine girl. I can tolerate some reds and have found a handful I really like that I keep in my personal stock. 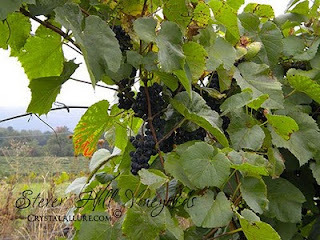 In fact, a few years back I happened to taste a port wine while in Pennsylvania and LOVED IT!!! 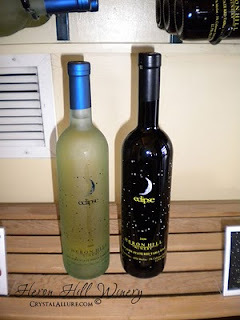 So when I discovered Heron Hill had both a red and white wine labeled "Eclipse", I simply had to share it with you. I (of course) like the white more than the red, but I pictured the bottles for all you Twilight fans out there. Come on now...how more ironic can you get...red wine...vampires...twilight?! You see it right? Vinifera Wine Cellars. 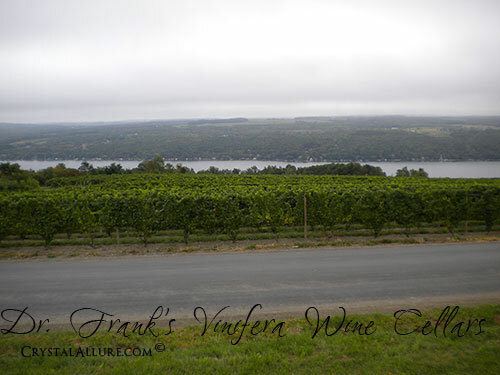 I'm pretty sure we picked up at least one bottle of wine from each winery but most memorable at Dr. Frank's winery was the view from the deck. Simply breathtaking. 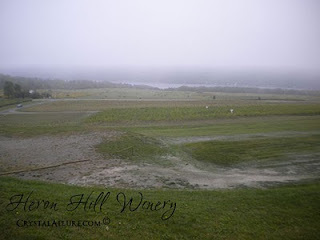 This same view could be seen to the left and right with miles upon miles of grape vines. The day may have started out hazy but it was the perfect setting for the beginning of fall and the harvesting of wine season. 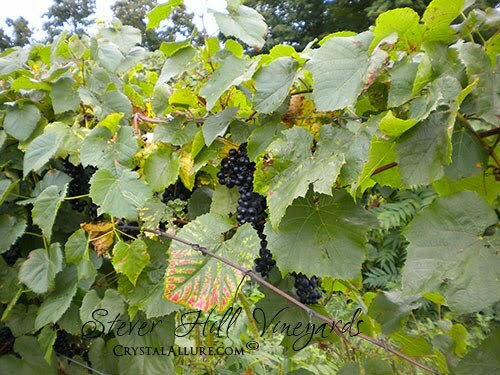 Our third stop was Stever Hill Vineyards. Here we were able to get up close to the grapes and snap a few delicious pictures. The tasting took place inside the barn and while we sampled some good homemade cooking, I spied three different colors of grapes in their containers off to the side. 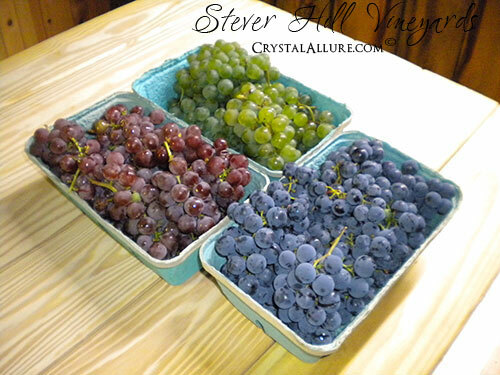 The colors were so lush and seasonally perfect that I had my husband assemble them into a "group picture" for you. Whether purposely placed there or not, they definately added some ambiance to the tour! 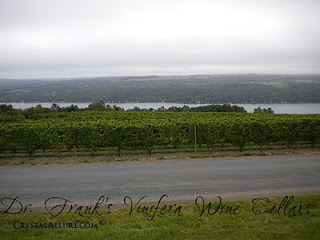 The last two stops were Hunt Country Vineyards and Keuka Spring Vineyards. At Hunt Country, everyone was so very friendly and they even had a mascot -Gus. He was a little shy but a beautiful dog! In fact, the vineyard creates a wine named "Gus" (which of course we purchased) and donates a portion of the proceeds to an animal organization. BTW -the "Gus" wine was delicious! The last stop for the day was Keuka Spring. Now, I don't know if it was the end of the tour, or if the servers had a long day -but ya know, wasn't so great. It seemed everytime the server started coming our way, he would serve someone along the way. It almost felt like he was ignoring us. At one point, I asked him if they had a paper copy of the wine selection list. He stood staring at me with this blank look for a few moments and then asked, "yes, do you want one?". Well, ah, yeah? Duh. Isn't that why I asked for one? So, sadly, not so great an experience for the last stop. All in all, it was a relaxing, great day with some friends. Tasted some new wines, picked up some new ones for our personal stock and enjoyed the beginning of the fall season.